Perennial from a felty-hairy, tuber-bearing rhizome. 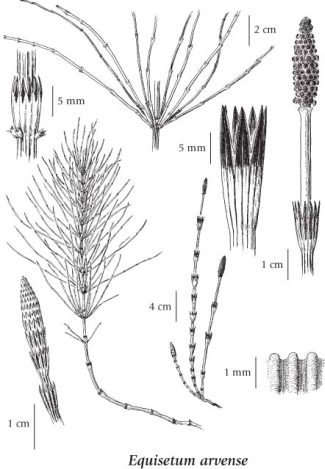 10-80 cm tall, 3-5 mm thick, with their central cavity less than 1/2 the stem diameter, regularly branched, the sheaths with 10-16 pointed teeth; branches in regular whorls, triangular in cross-section; the 1st internode of branches longer than the corresponding stem sheaths; fertile stems appearing in spring before sterile stems, about 10-15 cm tall, pale brown, unbranched, dying after the spores are shed, the sheaths 4-6, pale brown with 6-12 darker teeth. 1-4 cm long, with solid centres, rounded on the tops. Wet to mesic sandy or disturbed sites, streambanks, open places and shady forests from the lowland and steppe to alpine zones; common throughout BC; circumpolar, N to AK, YT and NT, E to NF and S to SC, GA, AL, MS, TX, NM, AZ, CA and MX; Greenland, Eurasia, N. Africa, New Zealand. A shade-tolerant/intolerant. submontane to subalpine. circumpolar horsetail (transcontinental in North America). Grows on nitrogen­medium soils within tundra, boreal, temperate,. and mesothermal climates. Common on water-receiving (floodplain. Seepage, springs and ephemeral streams) sites, frequently dominant in early-seral communities and forest openings. Characteristic of disturbed sites.